TORONTO — There will be no post-season for the Toronto Argonauts but James Franklin still has plenty to play for. Franklin begins his second stint as Toronto's starter Friday night at BMO Field against the arch-rival Hamilton Tiger-Cats. And for the 27-year-old, it's another chance to put his stamp on the starting job with the Argos. You can watch Friday's Live Mic Game across the TSN Network at 7pm et/4pm pt. "With all the changes that have come this year — not just at quarterback but the receiver position, the line, on defence — we've still got to figure out who we're going to be the rest of the season and into next year," Franklin said. "That's something we're really looking forward to. "It stinks not to be going (to playoffs) but we're going to make the best of it." Franklin first assumed the Argonauts (3-11) starter's job following incumbent Ricky Ray's season-ending neck injury in a 41-7 home loss to the Calgary Stampeders on June 23. But after throwing three interceptions in a 40-14 loss to Winnipeg on July 27, Franklin was replaced by McLeod Bethel-Thompson after posting a 1-3 record. Bethel-Thompson didn't fare much better, posting a 2-6 mark. After Bethel-Thompson threw four interceptions over the first three quarters of Toronto's 26-23 road loss to B.C. on Saturday. 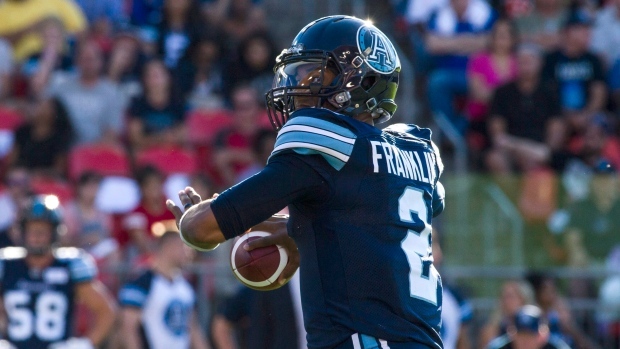 Franklin completed 9-of-14 passes for 103 yards and two TDs in the fourth quarter to rally the Argos from a 23-10 deficit. "Just productivity," Toronto coach Marc Trestman said regarding what he's looking for from Franklin on Friday against Hamilton (7-7). "Productivity like he had last week, both with his legs and arm. "He created a spark for us in the fourth quarter by getting us a couple of nice touchdown drives. We're looking for the spark we need to get us over the hump and back into the win column." Franklin is also playing for next year. He's the only current Argo quarterback under contract through 2019. Toronto had high hopes for Franklin when it acquired the Oklahoma City native's rights and a 2018 third-round pick from the Edmonton Eskimos for Canadian offensive lineman Mason Woods on Dec. 12, 2017. Three weeks later, Franklin signed a two-year contract extension with the Argos. The plan was for Franklin to serve as Ray's understudy this year before assuming the reins in 2019. But the process was expedited when Ray was injured. Franklin led Toronto to its first win of the season, a 20-17 decision over Edmonton on July 7, but did struggle over his four-game tenure. He completed 83-of-127 passes (65.4 per cent) for 900 yards with a TD pass and six interceptions while being sacked nine times. Ironically, Franklin sees himself more as a drop-back passing threat than a rusher. This season Franklin is 102-of-156 passing (65.4 per cent) for 1,073 yards with five TDs and six interceptions. He's also been used as a short-yardage quarterback, rushing 55 times for 203 yards (3.7-yard average) and 12 TDs. "I've never enjoyed running the ball and I've become more of a pocket passer over the years," he said. "I'm happy to (run) when I can but I definitely would rather have someone else do it, not because I'm lazy but I'd rather them have that kind of success. "Or throw the ball on a slant and let the receiver go 30 yards." Franklin said his time backing up Bethel-Thompson re-affirmed the value of patience while also serving as a teaching tool. "That's the mistake I made the first week or two and that's why I was really down on everything. But it was nice to learn about patience again . . . you've got to have some patience in order to have any kind of happiness in life." Toronto becomes the 10th Grey Cup champion to miss the playoffs the following season since 1958 and first since Edmonton in '05. And with no post-season berth on the line, Franklin expects his teammates to be loose against Hamilton, which is 2-0 this season against the Argos and battling Ottawa (8-6) for first in the East Division. "I want to see what kind of player I am," Franklin said. "Again, not force anything crazy but if I see an opportunity I might not hesitate as much this time because we have nothing to lose." Hamilton starter Jeremiah Masoli has a better road record (11-7) than at home (6-9). He's also undefeated at BMO Field (2-0) and has more career wins over Toronto (four) than any other CFL team. "That's going to be our role for the rest of the season, unfortunately," said Van Zeyl. "There's no such thing as a meaningless game against Hamilton because they're Hamilton. "It's one of the storied rivalries of the CFL and North America. I've been battling against these guys for years and enjoy it every single time." Key matchup: Argos QB Franklin vs Ticats defence. Franklin returns as Toronto's starter after going 1-3 under centre earlier this season. The Argos are second-last in offensive points (19.6 peg game), yards (323) and rushing (94.5) and seventh in passing (241.9). Hamilton's defence is allowing 22.1 points per game and surrendered just 35 TDs, second-fewest in the CFL. The big number: 6 — Number of games Toronto has lost in a row. Who's hot: Hamilton starter Masoli has 10 300-yard passing games this season. He's also recorded 12 TDs and just three interceptions in his past five games. Who's not: Toronto's defence. It's last in the CFL in offensive points allowed (28.9 per game) and turnovers forced (21) and tied for last in touchdowns (44) and passing touchdowns allowed (26).